Show your family and friends how well you know them with an assortment of cookie flavors chosen just for them! 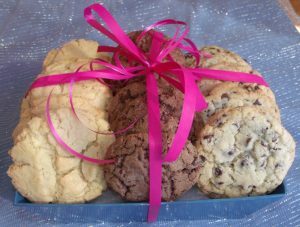 When you purchase a Customized Cookie Assortment you choose three flavors, occasion and your personal message. Nationwide shipping. Local delivery available in the Seekonk, MA area upon request. Your Customized Cookie Assortment will contain 12 fresh baked cookies of your choice. Our small batch, hand-scooped cookies weigh between 1.5 oz. – 2 oz. depending on the flavor. Don’t see the cookie flavors you’re looking for or want to tweak a recipe? Customize It!